Dungeness River at the Bridge. 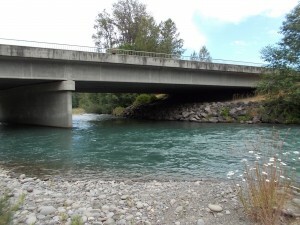 The Dungeness river is located on the Olympic Peninsula in Sequim Washington. Although the salmon season is only two months out of the year (October-December), the dungy offers a great Silver Run of above average size fish. With a daily bag limit of 4 silvers per day, this fishery is sure to help fill the freezer with some grade A+ Coho salmon. In this exact spot, in 2012, I caught a beautiful, bright 15lb buck, making this Lunker location near and dear to my heart. During most of the season regs for this river are pretty much the state standard but from the beginning of October till the end of December the Dungy is open to Salmon fishing. When fishing this Lunker location for best results we recommend drifting or plunking eggs, next best option is an orange corky and yarn or orange with salmon egg stink. Also when the run is hot a orange colored blue fox number 4 can be very effective as well.